CDI College's Dental Assisting program offers the focused, relevant, job-ready Intra-Oral level I and II training you need to work in a modern dental practice. In the Dental Assisting diploma program, you'll learn how to prepare treatment rooms and patients and also assist dentists with performing treatments. Your Intra Oral I training will include preparing and using various tools and materials for use during those treatments and performing infection control procedures, assisting with the suctioning apparatus, as well as handling clerical tasks in a dental office. Graduates who complete the Dental Assisting program at CDI College are eligible to write the National Dental Assisting Examination Board (NDAEB) Certification Exam, which when passed gives you the title of Certified Dental Assistant. Your Intra Oral Level II training includes learning to expose, process, and mount digital radiographs, polishing teeth, applying topical fluoride and topical anesthetic, and take impressions of teeth, apply sealants, install and remove dental dams, take preliminary impressions for study casts, as well as instructing patients on proper oral care. CDI College's Dental Assisting diploma program is the right place to train for your new career in the dental field, and with our accelerated, hands-on training, you'll be out working in less than a year! This course provides an overview and introduction to the Dental Assisting Program. Emphasis will be placed on the required safety precautions required for the dental assistant. It also addresses the concept of standard precautions, dental health care worker safety, and relevant clinical procedures including barrier techniques, surface cleaners and disinfectants, and proper heat sterilization. Radiation hygiene and safety procedures will be emphasized. This section will discuss the professionalism and legalities of all members of the dental team. It will enable students to understand the expectations of the profession and the workplace. Students will consider their role on the dental team, identify other members of the team, develop an appreciation for being affiliated with a profession, and learn how to use a problem-solving approach to deal with conflicts that may arise within the dental team. Topics include the history of dentistry, members of the dental team, responsibilities of the dental team members, professional organization, dental ethics, dentistry and the law, and dental terminology. Students are provided with an understanding of normal anatomy and physiology beginning with an introduction to the human body and its functions. Students will learn detailed anatomy of the head, neck, and will examine the normal development of the oral cavity and facial complex, teeth, and the attachment unit. Topics include body direction and planes; structural units; body regions; body systems; oral embryology and histology; tooth morphology; nomenclature and identification; facial and intra-oral landmarks; general anatomy of the tooth and periodontium; anatomy of head and neck; numbering systems; and blacks cavity identification. This area of study provides students with the fundamental knowledge of the bio-materials commonly used in the dental environment. Lectures will cover the physical and manipulative characteristics of the various dental products. The laboratory segment prepares students to correctly manipulate these diverse materials. Topics include structure and properties of dental materials; dental materials and the oral environment; restorative and aesthetic dental materials; dental cements, liners, bases, and bonding systems; impression materials; gypsum products pouring and trimming of models; fabrication of custom trays; and waxes acrylic material and precious metals. This course also introduces students to the proper handling of hazardous chemicals, employee safety, and waste management. In addition, students will learn how to avoid musculoskeletal disorders commonly associated with dental assisting. Students will be introduced to a wide variety of instruments and procedures used in dentistry. This component will assist students in developing the skills and recognizing the importance of smooth interaction with the dentist providing quality care while working chairside for various procedures. Students will learn the theory and practical elements of restorative dentistry. Emphasis is placed on the dental assistant’s role in operative procedures. It includes chairside assisting, as well as the implementation of the dental materials used in dentistry. Students will learn the principles of cavity preparation; moisture control; instrument identification; instrumentation; care of instruments and sterilization; clinical equipment; team dentistry; operating zones; team positioning; identifying name and function of dental instruments; and assisting and all aspects of four-handed and six-handed dentistry. This segment provides an opportunity for students to obtain the knowledge and acquire techniques and skills required to assist clients in the prevention and control of disease and injury to the oral tissues. Importance is placed on communication skills and methods of assessing, implementing, and evaluating individualized hygiene. Students will study the common microorganisms and pathogens with emphasis placed on those found in the oral cavity. This course will provide students with the prerequisite knowledge required to practice effective infection control procedures in the dental environment and to prevent cross-contamination. This segment focuses on the developmental disturbances, their clinical manifestations associated with the development of the oral cavity and the pathology that can affect these structures throughout the life cycle. Students will acquire the knowledge to recognize normal and abnormal tissue anatomy as it relates to the role of the dental assistant. This section will provide students with a level of knowledge and skill to acquire patient information, obtain vital signs, and assist the dentist in the diagnostic stages of the dental care provided. This course introduces students to the basic principles of oral medicine. Students are provided with the terminology, medicinal use, physiological actions, adverse responses, and classifications of drugs encountered in the dental office or commonly prescribed for clients. This component provides students with the knowledge and skills that are required to recognize and prevent medical and dental emergencies within the dental office. It will prepare students to assist the dentist in administering immediate care for the client in the dental office environment. Students also participate in CPR/First Aid training. This course prepares students to take and process intra-oral and extra-oral dental radiographs according to provincial/federal standards. Students are introduced to basic physics and principles of radiography, safety precautions, and the operation of the dental x-ray unit. They will expose dental radiographs using bisecting angle and paralleling techniques. Instruction will be provided on recognizing dental errors and solving problem situations, along with client education and management. This segment will cover the key competencies related to office practices and administrative responsibilities of the dental assistant. This course will provide students with the knowledge and skills related to basic dental reception procedures. Topics will include the organization and management of patient records, appointment control, dental claims, financial procedures, and the utilization of dental management computer software. 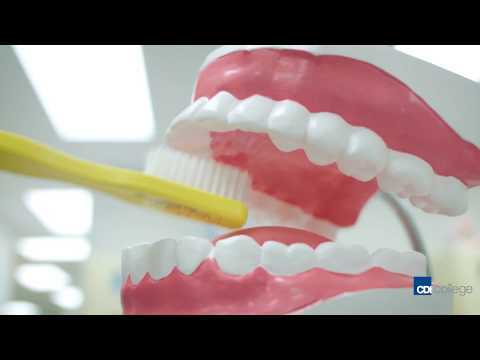 This segment is designed to give students an overview of the various dental specialties. Students will learn the theory and practical skills relating to the various disciplines. The roles of the dental assistant will be examined in relation to these specialties. In the Phase I component of this program, there is a Midterm Exam as well as a Final Practical Clinical/Laboratory Examination. A mark of 75% is required on all examinations in order to advance to Phase II studies. In the Phase I component of this program, there is a Final Exam as well as a Final Practical Clinical/Laboratory Examination. A mark of 75% is required on all examinations in order to advance to Phase II studies. Students must complete the Final Practical Clinical/Laboratory Examination. A mark of 75% is required on all examinations in order to advance to Phase II studies. This program includes a practicum component consisting of 80 hours working in private practice with a dentist during Phase I of the program. This practicum work experience is a mandatory diploma requirement and the dentist does not pay for the services of the student during the practicum. Students will gain a better understanding of themselves through an exploration of their personal attributes, transferable skills and learning styles. This course will introduce techniques for time, conflict, and stress management and develop< interpersonal communication skills. Fundamental study and motivation skills will be covered, preparing students to excel in their program of choice. Students will also prepare a professional resume and learn how to write effective cover letters. This course will provide students with the theory required by a dental assistant to perform direct patient care. An ethical decision-making framework will enable students to utilize problem-solving skills to plan for and manage direct patient care and to respond to patient-specific needs as they relate to the clinical practice of a dental assistant. In-house clinical and outside practicum experience will provide an environment for students to apply and adapt the knowledge and skills obtained. This program includes a practicum component consisting of 60 hours working in private practice with a dentist during during Phase II. This practicum work experience is a mandatory diploma requirement and the dentist does not pay for the services of the student during the practicum. Start training for a new career in the dental field with help from CDI College's Dental Assisting diploma program.